It has been some time since I’ve written up a new game. We have actually played several new (to us) games over the last couple of months, but with most of them we just haven’t got to the point where Miss B wants to give a verdict. We do have one now, though: Piece o’ Cake. Miss B wanted to do the photography this time, and even with a broken arm she does a better job than me, capturing the essence of the game as well as my stylish and understated shirt. I had heard of the game a couple of years or so ago, but we only got to try it out during a visit to the Thirsty Meeples boardgame cafe in Oxford. Everyone enjoyed the game and I totally fell in love with its elegance. Unfortunately it is out of print (at least in English), but a couple of days later I managed to find someone selling a copy of the German version (called “…aber bitte mit Sahne”) through the BoardGameGeek marketplace. The game is completely language independent (apart from the rules, which are downloadable) so we are now the proud owners of this little gem, which we have played a few times since. So, I may have given the impression that I like the game, but how does it work? Well, basically, Piece o’ Cake is a game about sharing pieces of cake. Each round one player lays out a cake which comprises slices of different varieties: chocolate, strawberry, gooseberry, and so on. 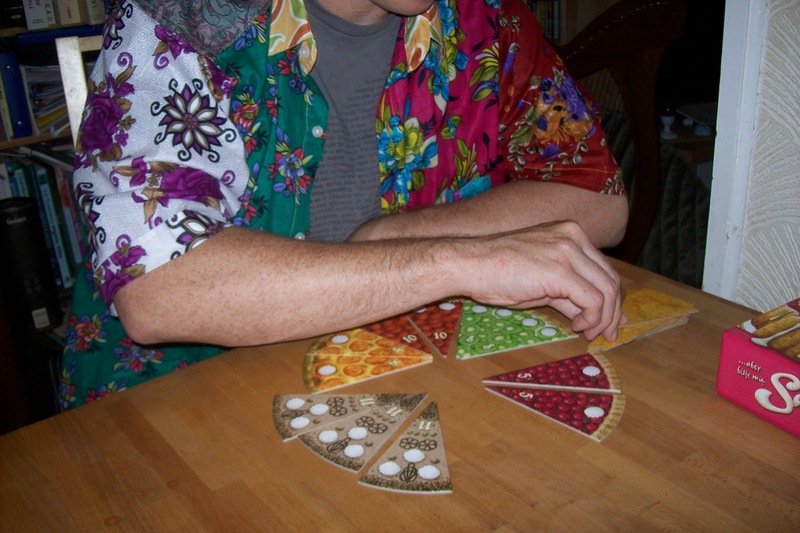 There are 11 slices laid out each time, and the player whose turn it is divides the cake into portions, one per player in the game. Each portion can have one or more slices in it and due to 11 being a prime number, there will always be at least one portion of a different size to the others, which is a neat touch. Each player chooses a portion to take, with the player who chose the splits taking last. For each slice taken, each player chooses to either eat it (which will score points equal to the number of dollops of cream on it) or keep it (which scores more points for the player with the most uneaten slices of each type of cake). That’s pretty much it other than a rule where you can pass your turn in order to just eat a load of cake you had previously been keeping. You go through all this process five times and then count up the scores. The game is actually really mathematical, with a bit of push-your-luck and psychology thrown in, but it plays so easily that most people don’t notice, and just have fun sharing out slices of cake. I’ve played this now at all player counts from 2 to 5 (Miss B hasn’t been in on a 5 yet) and have to say that it is weak (though not awful) with 2 players, so I don’t expect I’ll be playing it with Miss B alone all that often, but other than this it is absolutely great. Miss B seems to enjoy puzzling over her decisions and figuring out her best options, and has fun regardless of her end score. And to round off, this was the first game she got out over the weekend when some friends came around to play games with us. 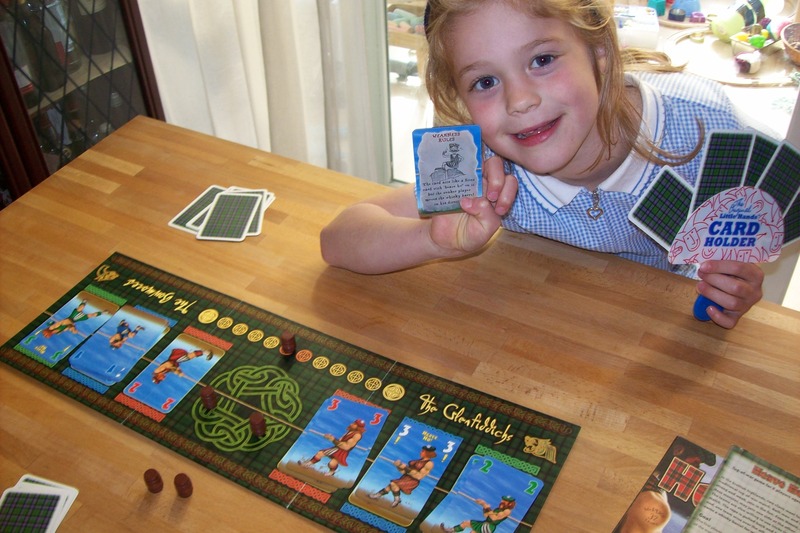 The game: Piece o’ Cake/…aber bitte mit Sahne (Rio Grande/Winning Moves), 2 to 5 players aged 8+. I want to push the river! Niagara is a game with a gimmick. The board sits atop the game’s box and depicts a river running towards a waterfall, which tumbles over the end of the box. The course of the river is recessed into the board and movement spaces are provided by clear plastic discs that are, after each round, pushed along the watercourse towards (and over) the falls. This is all rather cute, but combined with the fact that you are trying to manoeuvre boats in the river to collect valuable gems from the banks by playing movement tiles, this means that you are playing a game of brinkmanship with how close to the falls you dare go, and there can be real tension as you wait to see how this will all work out. The game is really for three or more players, but Miss B and I play together by using two teams of coloured boats each. We further speed things up by allowing victory to be gained by the combined scores of our colours and making it a little easier to pick up gems. So, this gimmick… Well, it’s a really good one. Occasionally the discs get stuck at the fork above the falls, but you just nudge the stuck disc in the opposite direction to the last one to fall and it’s all fine. We love watching the dynamics of the board and how sometimes you get two discs in a row taking the same path at the fork, causing panic or cheering, depending on how it went for you. We have only played two-player games so far, but are looking forward to getting into a bigger game some time soon. Good, silly stuff. 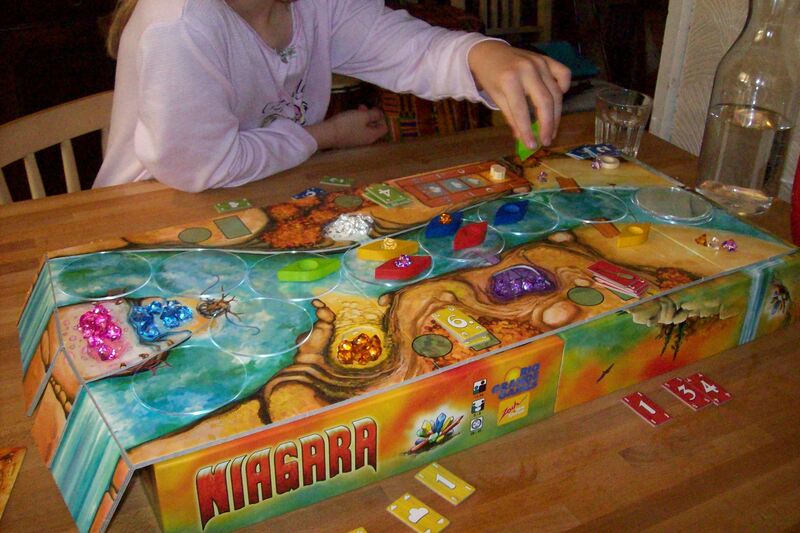 The game: Niagara (Rio Grande), 3 to 5 players aged 13+. While I write here mostly about new games we play, a lot of what we play is return trade. Well, it would be crazy to only play new stuff, right? So as we have been writing this blog for over two years now, perhaps it would be a good time to start revisiting some of those games we covered in the early days and seeing how things have changed. The Glenfiddich clan are about to find themselves on the wrong side of a “Weakness Rules” card. Again. Anyhoo, Heave Ho! was the first game we covered in this blog. It hasn’t been played an enormous amount over the last couple of years but it does come out for play once in a while (twice so far this year by my reckoning). When I last wrote about it we were playing a very cut-back version of the game with one shared deck of cards containing no action cards. Plus initially we weren’t using the “robust dames”, which are a suit of wild cards. We now use the full rules except for the “team building” step, which involves a race to sort through your half of the cards to pick the best cards for yourself. So this is still a game that provides us with some good fun. The main part of the game is adjusting the strengths of two teams and playing a “Heave Ho!” card when your team has the highest total strength as you then pull the barrel (yeah, I know…) a number of spaces towards your side equal to the difference between the teams. This involves constant adding and subtracting of numbers and two years ago this took quite a long time, meaning that we only played one round in a sitting. Nowadays, Miss B is getting very into the idea of maths and is getting much quicker at this so we usually play to the recommended best-of-five. I reckon this game is more of a winner than it was when we first played it, and the anticipation of possibly getting a “monstrous” card when Nessie is in play (you can make her eat her own team!) is something that keeps Miss B coming back for more. The game: Heave Ho! (Kosmos), 2 players, age 10+. Felicitously, at a recent fête our family found for few funds a fully functional copy of the fast, fun and furious game Fast Flowing Forest Fellers, which was fabricated by the fabulous Friedemann Friese for five or fewer folk. The female blue lumberjack safely negotiates a log while the other competitors jostle for position in the narrows. Alliteration-R-us. I’m sure there are some of you out there who could do better. Basically this is a race between a bunch of lumberjacks riding logs down a river. You control two or three lumberjacks each (depending on the number of players) and have a deck of cards, each of which allow you to move one of your people a number of spaces, jostling others as you go. The first player to get their whole team past the finish line is the winner. I’m not sure how a lumberjack riding a log can navigate upstream, mind you, but I’m happy to gloss over that. It doesn’t seem to bother Miss B.
I really rather like this and it is certainly worth the small sum we paid at the school fête (which was rather higher than the stupid asking price). It takes moments to explain and is, for the most part, very intuitive to play. It’s a fun race game with plenty of opportunity to stuff your opposition by shoving them into adverse currents. And it comes with a heap of different boards (some more conducive to stuffage than others), which you pick two of to construct a course for the race meaning that there is plenty of variety to be had. Miss B got the hang of how the game works almost instantly and liked the fact that there are both boy and girl lumberjacks, which is certainly a good touch. There was a point in our game, though, when Miss B was getting a little frustrated by a current heading in the wrong direction which she kept getting stuck in, but after she got one of my lumberjacks with the same trick, things brightened up significantly. I’m looking forward to trying this with more players, as that should add to the chaos. A lot of the game seems to be about the jostling; you can make more of your moves by having your lumberjacks push one another along as well as barging the opposition out of the way. Yup, I’m hoping for some more plays of this. 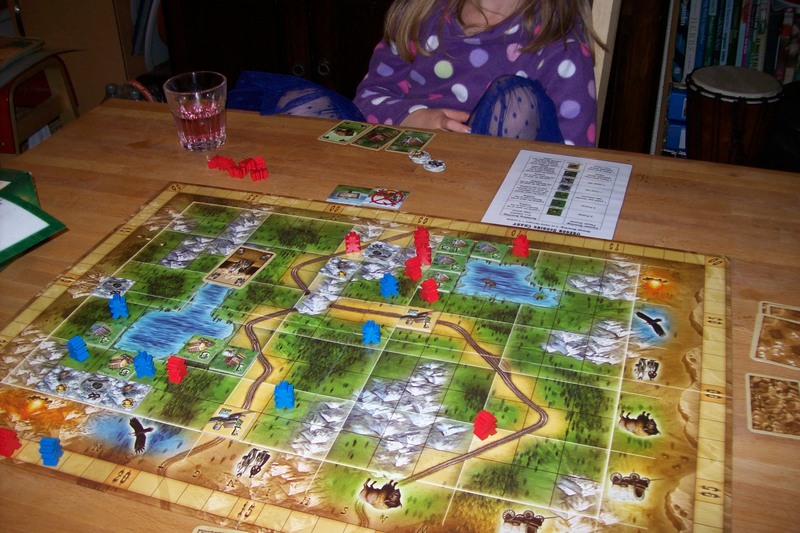 The game: Fast Flowing Forest Fellers (Rio Grande), 2 to 5 players aged 8+. I’ll buy your elephant and then I’ll get a baby elephant! One of our most played games is the quick and elegant Coloretto, which involves collecting sets of coloured cards while trying to not have too many sets. Zooloretto is a big box adaptation of the game, adding a nice theme (collecting animals to go into your zoo) and nearly tripling the price. Actually, there are enough changes to the game that I am very happy to have both in the collection for playing on different occasions. Miss B’s zoo receives a delivery. I’d been meaning to get a copy of Zooloretto for ages and, at last, a trip to the Gameskeeper (a fantastic shop in Oxford) resulted in us taking a copy home. Actually the trip was fun all round; S was chuckling to herself at the conversation with the staff who were trying very hard to recommend games for us: “Have you tried Hey That’s My Fish?”, “Yup, got it.”, “I assume you have Carcassonne?”, “Yup”, “Tsuro is back in stock and that’s nice”, “I agree, we have that too”, “How about Citadels?”, “Yes, that too”… Actually, I think this really showed that they managed to get onto our wavelength as they did suggest a lot of games we love, plus a few new ones we’ll hopefully check out some time. We got the game home and, that evening, had our first game for the three of us. There is a bit more to think about than in Coloretto due to the addition of money and things that you can do with it. Miss B took a little while to get to grips with things but towards the end she demonstrated admirable understanding of how things worked by, without guidance, moving one of her concession stalls to a location where it would be much more useful. We’ll certainly still play Coloretto fairly regularly as it takes up little space and we play it in only about 10 minutes. However, for something a little meatier and a lot cuter, but still not too lengthy (this first game came in at under an hour) I think Zooloretto is looking like an excellent purchase. 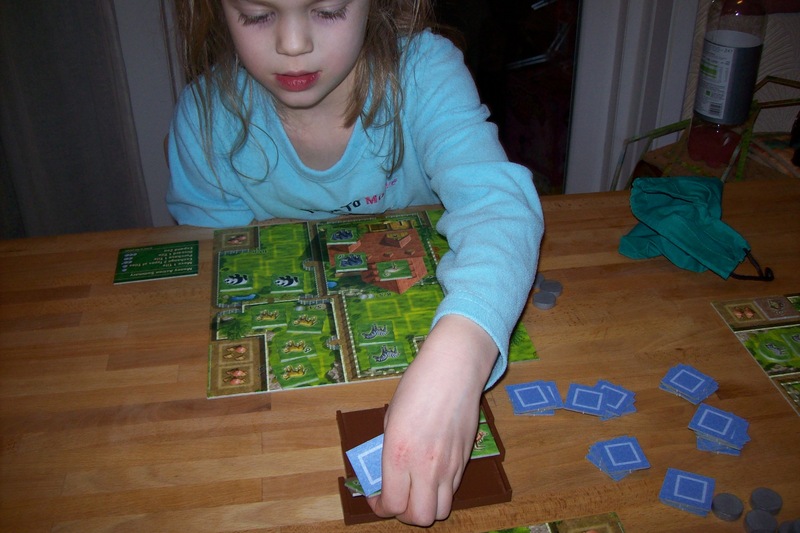 The game: Zooloretto (Rio Grande), 2 to 5 players aged 8+. Oregon is a game that I picked up at The Works (a UK discount book store) because it was cheap, had reasonable ratings and reviews on BoardGameGeek, and had cowboy meeples in it. We have finally got around to playing it, and it’s pretty good. It’s all about distributing buildings and farmers (aka cowboys) around an area of countryside in a way that allows them to interact and earn you points. Miss B sits back to sup on a Ribena and think about where to build that warehouse. This is one of those games that I think you kind of figure out in play and things that sound like they might be a bit tricky are actually pretty straightforward once you get to do them. The theme is pretty thin but it all looks nice with cute tiles for the buildings and those awesome cowboy meeples. After a few turns I got a bit of a telling off from Miss B. Each turn I had been outlining to her what options were available and making a couple of suggestions of moves she might want to make. She told me that this was annoying and that I should not tell her what to do unless she asked for advice. Fair comment, of course, so I backed down and let her play. From then on she asked for help a few times but did very well (she actually won the game!) and it is notable that the first move she made after shushing me was one of the moves I would have suggested — and probably the one I would have chosen myself. This is proving to be an ongoing issue that is really hard to get right: how much do I help Miss B on her turns? 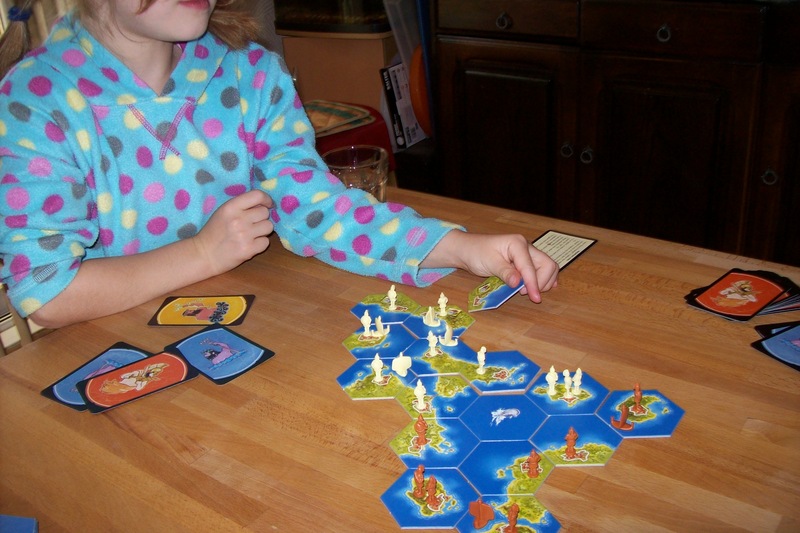 I want to make sure she understands what options she has available and prevent her making really bad moves, but I also want her to be able to understand the game situation and make her own decisions. Luckily she is fairly independent minded and wants to be in charge of things, so there isn’t much danger of her simply relying on an adult’s instructions. I think the way forward is to offer advice at the start of play and encourage her to tell me when she wants to “go solo”, then she can ask for advice later if she wants. I still reserve the right to give an “are you sure?” if she does something that looks like an obvious bad move. 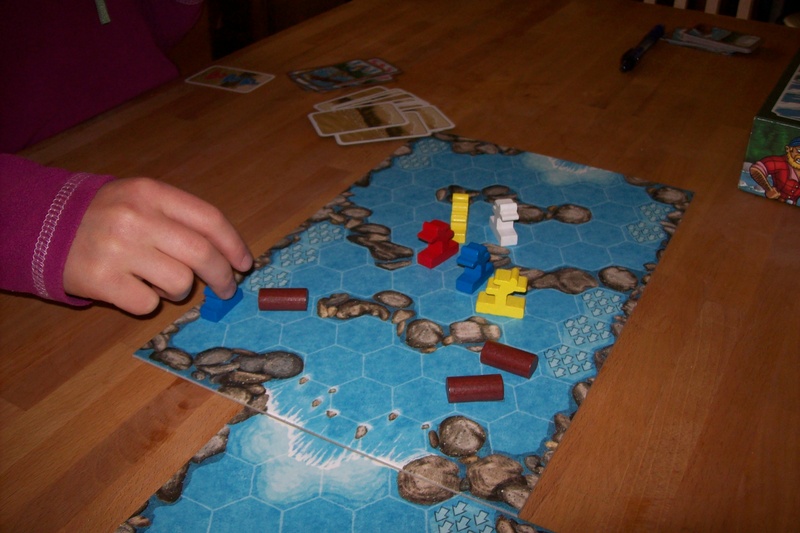 The game: Oregon (Rio Grande), 2 to 4 players, aged 8+. A recent acquisition, Hellas is the most “wargamey” game I have yet played with Miss B. It’s part of the Kosmos range of 2-player games and features exploring the world by drawing and placing nice looking hexagon tiles which feature sea and islands, and using your Greeks and ships (represented by nice-ish models, though the Greeks fall over a lot) to expand and conquer your opponent. You can also invoke the help of the gods (by playing cards) which will allow bonuses, extra moves and so on. We didn’t manage to finish the game, unfortunately. We were both within a couple of points of winning but the process of warfare proved to be rather less than fun for Miss B. I’m sure there are options for house ruling ourselves a new game based on Hellas that would be more fun, but I expect that won’t happen for the time being. The voyaging and exploring parts of the game were just fine, but the combat was definitely not. This is probably our real failure. I picked up the game because I like the concept of Hellenic-era island-hopping war and it looked like it would tick some boxes for me. I hoped Miss B would get on with it, but figured that it should be at least a decent addition to the collection for me. This was definitely a risky exercise as we haven’t played games with quite such direct fighting between players before (wait, no, correction: apart from Magic) and, based on this, we’ll probably mostly avoid that for a bit longer. That said, I think I saw enough of the game to decide that it was a reasonable purchase for myself. I’m looking forward to some adult play on this one. The game: Hellas (Kosmos/Rio Grande), 2 players aged 12+. Do you want sprinkles with that?